[Interviewer] You’re on the tape saying that dollar/yen is going to 200. [Kyle Bass] If I’m right, it will go much further than that. I don’t think it will hit 500, but in crises, currencies swing too far. They can start discounting 15% or 20% rates out ad infinitum because they are in a full bond crisis. But once they flush the debt and have a reset, you’re not going to have 20% rates ad infinitum. We’ve committed more capital to the currency market, but all of the convexity is in the bond market. I will start by pointing out that this was an interview covering a lot of topics, and the "Japan Convexity Trade" was just one area of discussion. As such, we do not see the full logic behind Bass' analysis of Japan. I do not consider a country that has achieved price level stability over the past 15 years as being the strongest candidate for of out-of-control inflation, but perhaps I am just being complacent. The possibilities for the yen are interesting, as I think they illustrate the differences between "randomness" and "uncertainty", which is a concept that Keynes raised, and is often discusses in Post-Keynesian circles. (As an example, see this blog post by Lars P. Syll, which quotes Paul Davidson. There are more discussions of this on Lars' blog.) I would note that this is my interpretation of this distinction between "uncertainty" and "randomness"; I may have missed subtle points in the argument. 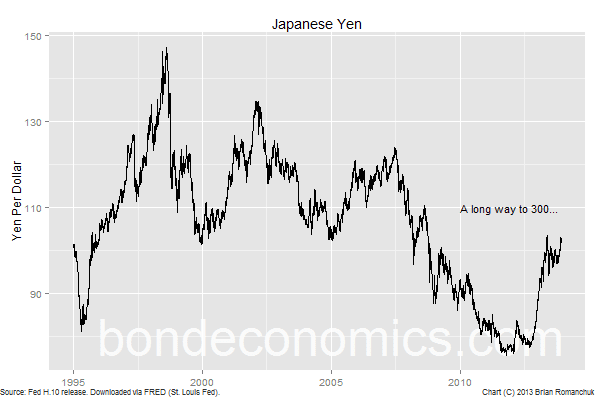 As long as Japan avoids out-of-control inflation (or even a hyperinflation), I do not see how the yen weaken to 300 to the U.S. dollar as a result of the usual operation of the global economy (I chose 300 as a nice round number within the possible range Kyle Bass indicates is possible). From the point of view of a stock-flow consistent analysis, the loss of roughly two-thirds of the external purchasing power of the yen would create spectacular imbalances within the portfolios of Japanese investors. (I make the reasonable assumption that the revaluation of the yen would be larger than the swing in nominal values of foreign assets.) Since they have actuarial liabilities denominated in yen, their portfolio rebalancing would swamp trade and speculative flows. (Japanese domestic investors would repatriate the proceeds of selling foreign assets to buy domestic assets.) And that is not counting the potential profits from reversing Japanese government forex intervention; the Japanese government would win the title of "Greatest Trade Of All Time" under that scenario for the yen. That said, I would not want to take the other side of Kyle Bass' trades, as he indicates that the payoff structure is "highly convex" (very high ratio of potential profits to maximum losses). And the reason is Keynesian uncertainty. Even if one thinks there ought to be a risk premium, it should be small, as the market-maker extracts a bid-offer spread when buying and selling options. Any other pricing strategy will put the market maker out of business for one reason or another. Such options live in the standard world of "randomness"; i.e., they are described well by standard financial theory which assumes things like rational expectations. However, that world breaks down for a monstrosity like an option that is in-the-money if the yen/dollar rate is above 200 in two year's time. Blindly applying the same option-pricing formula gives a tiny value to that option at present. (This is even if the market maker pushes the skew in his or her favour.) This implies that if the yen does hit 300 within two years, the payoff to the buyer of the option is spectacular relative to the option premium paid. Hence the "convexity". I said above that the yen would be barred from hitting 300 if the economy and markets were functioning in their typical fashion. However, we face Keynesian uncertainty. In the world of the nineteenth century, an occurrence such as a blockade was something that investors would face with regularity. In a world armed with nuclear weapons, modern military doctrine argues that such geopolitical flareups amongst developed powers are essentially impossible to contemplate. But what if tensions get out of control? As Keynes said, we simply do not know what will happen. Keynes argued that we are stuck extrapolating the current situation (like an absence of a blockade) as a convention. In the case of market makers in options, they are stuck extrapolating something resembling current market conditions to price deep out-of-the-money options. And as a result, they may be handing opportunities to investors like Kyle Bass, who are buying options on uncertainty too cheaply. Hyperinflation can hit suddenly after deflation. It just needs a big bond market to get monetized by a central bank, which can happen fast if everyone panics out of bonds. I have over 30 explanations for hyperinflation and am looking for more if anyone has any.